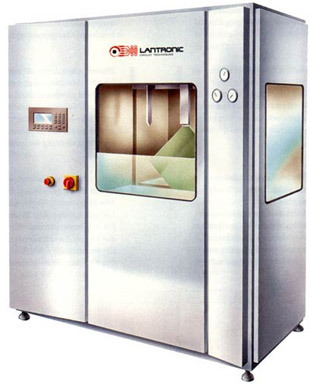 LANTRONIC® has a long standing reputation as a manufacturer of high quality Hot Air Solder Leveling Systems. An on going research and development program in partnership with ACS Technologies has resulted in the latest generation of Lead Free Solder Hot Air Leveling Systems featuring the patented Tru Track Clamping System. Lantronic Hot Air Solder Leveling Systems are built to the highest standard. Simple operation and maintenance procedures are features of the machines, with many models to suit all sizes of manufacturer requirements. All Lantronic Hot Air Solder Leveling Systems are designed with operator safety and simplicity in mind. All systems are fully enclosed with stainless steel interlocked doors and a safety window which closes during operation. All covers are easily removed to allow access for cleaning and maintenance. The specially designed Tru Track Clamping System eliminates the need to punch holes and the fully adjustable Air Knives leave the finish that you and your customers require. The Tru Track Clamping System was developed to support both the top and bottom of PCBs when processed at the 45° angle. The revolutionary clamping system, when leveling the panels at the 45° angle, clamps the top of the PCB while bottom of the PCB is supported by the Tru Track. The standard clamping technique only clamps the top of the PCB and has no bottom support. We have found that supporting the PCB at the bottom guides the PCB instead of pushing the PCB into the solder pot like most traditional clamping systems do. This breaks the surface tension of the solder pot and eliminates the PCB from bowing, which gives a more front-to-back uniformity. The up and down movement of the clamp assembly is AC motor driven for a more precise travel of the clamp assembly. Air Knife Adjustments: Both the front and rear Air Knife angle and distance can be adjusted and are independent of each other. They can be easily removed from the Air Knife Chamber for complete access to the Solder Pot. The temperature of the Air Knives are adjustable as well. Clamp and Air Knives: The Clamp and Air Knives are constructed out of high grade titanium. Construction: Balance of system constructed of stainless steel. Automatic Safety Door: Ensuring the safety of the operator during the leveling cycle. Warranty: 6 month parts, FOB our factory. The Model TT30 is built to meet the latest requirements for solder leveling. 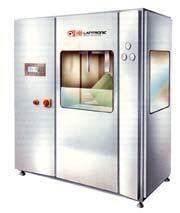 It combines high quality performance, repeatability, and reliability at a minimal cost. The construction and the newly designed package makes the machine easy to operate and maintain. The PLC controls and or monitors all the functions of the Model TT30 system. The display, displays the present value of the Solder Pot and Air Knife temperature at all times. It will display the set value of the Solder Pot and Air Knives, the selected Dwell Time of the Solder Pot and the selected Level Time of the Air Knives. In addition, you can adjust the up and down speed of the Tru Track Clamp Assembly. Three amperage meters, one per leg to monitor the amperage draw of the Solder Pot at all times. This eliminates the need for the maintenance person to stop production, if he feels the need to take an amperage reading. The displays are right there! Operator can manually blow or open/close the Air Knives, position the Tru Track Clamp Assembly or the Clamp in either the up or down position and close the Safety Door while the machine is not in operation. The Hot Air Leveling range starts with compact relay controlled machines and progresses through to sophisticated PLC controlled systems. To complement the range of HASL systems, ACS offers a complete line of Horizontal Pre/Post Cleaning Systems, Fluxing Systems, Dryers, and Material Handling Systems.